Over the last five years, I've spent more than 60 days and nights at the U.S. Open. The early days at the Open can be really, really overwhelming. There's tennis everywhere, and people everywhere, and you constantly feel as if you have to be missing something. Probably the good part. But there are lots of good parts. It's just a matter of finding them. Here are a few ways to navigate Flushing so you don't have to go home and half-heartedly pretend you had a great time, when really you just stood in line and couldn't find a decent match to watch. I have tickets for a day session during the first week of the Open. What do I do? That's awesome. Go walk the grounds and look for some competitive tennis. But I have tickets for Arthur Ashe Stadium. How fancy. Now lose them. 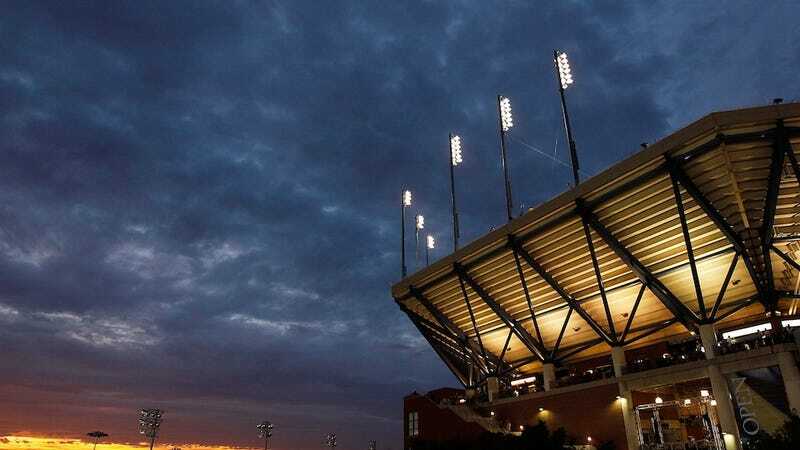 There is absolutely no reason for anyone other than the players or press to ever set foot in Arthur Ashe Stadium for the first five days of the Open. It is half-empty and delirium-inducing, a giant echoing bowl with an endless string of bad tennis matches rattling around in the bottom. Yes, you can see a name player there—sleepwalking through a drowsy straight-set win over a no-name player. In fact, defending Open champ Sam Stosur just finished the first Ashe match this year. She won the first 19 points of the match, and won it in 51 minutes, 6-1, 6-1. Expect a lot of this. Then where do you watch during the opening week? If you want to see great tennis, park yourself at Louis Armstrong, the Grandstand, or the brand new Court 17. I can't remember any particularly great matches at Court 17 last year (its first year as a court), but the sunken-in court has a very college stadium-y feel to it, and if it gets a five-setter, it'll be an awesome atmosphere. As for Armstrong and the Grandstand? They will absolutely deliver great tennis. Players are more proportionately ranked, so you'll get five-set and (for the women) three-set matches (I calculated it a couple of years ago, and there's a significantly better chance that you'll find matches that go the distance here). Smaller crowds, crazier settings, better tennis. Just be sure to pick up a draw when you arrive and to map your day out that way. O.K., fine, but I have tickets for night matches during the first week. Can't I go to Ashe then? Look for great night matches elsewhere. There will be plenty of matches on the outer courts. Ashe matches will likely go the latest. Use the stadium as your last resort. Is Ashe ever fun during the opening week? Yes. Late at night. If for whatever reason, matches get backed up, post-11 p.m. tennis makes Ashe a hilarious, wacky, freewheeling scene. By time we get to Labor Day weekend, enough bottom-tier players will have been winnowed out that Ashe will be a perfectly suitable venue for day matches. You can head there then. What are the worst sessions to have tickets for? Night tennis on the first Saturday and Sunday nights. I've had friends who fell for this trap in the past, to their deep regret. If you have these tickets, I'd recommend selling them and upgrading to something else. CBS has daytime coverage on Saturday and Sunday, so all the good players get sucked up then. By time night rolls around, the Tennis Channel takes over and the matches are very un-marquee. Despite the fact that the Open seems a little fancier and a little richer than your normal sporting event, the food at the Open is awful. Let's start with the food court. Do not eat a hamburger. Do not order anything from that "grill" place. Anything that is marginally OK—the Carnegie Deli, the seafood place, the pizza and pasta place—will have a line from there to the 7 train. It's just not worth it. The one place that serves up the most consistently solid food and always—always—has the shortest line is the Indian place. Go there. Otherwise? At the base of the bleachers of Court 7, there's this little place that's called the South Plaza Café. They usually have Cafe Metro-quality sandwiches there and paninis and things. This is fine, and since it's positioned far, far away from the food court, people generally have no idea it exists. I can't ever remember a line there. The best bet: There will be a bunch of hot dog vendors outside the U.S. Open site, at the edge of Flushing Meadows Park. They are usually fine! Otherwise, just wait it out, take the 7, get off at Woodside and go to a random pub and get a burger. Or go the other way, to Flushing Main Street, and feast on something from Sichuan or Xi'an or Dongbei. I like smoking. Can I smoke? Yes, freely. There is probably no open space in New York that permits so much smoking. Maybe they'll change it this year? But every year before, I have seen people smoking all over the grounds, without incident. I have no idea why—too many people? A European ethos? The fact that a few USTA people like smoking?—but you have free rein. I'd like to see some good tennis but I don't want to pay insane prices for the semifinals or finals. When should I go out? Go during the second week, between Tuesday and Thursday, in the daytime (that would be Sept. 4 through Sept. 6). There are mind-bogglingly great matches played before crowds of near-nothing at Ashe and Armstrong during the day. Since this is the post-Labor Day stretch of the Open, everyone returns to work and gives up coming out to Queens. This is also when Ashe finally offers up good tennis. Don't bother buying a ticket through the USTA. Go to StubHub or Craigslist a day or two before you want to go. Size up the potential matchups. You can get tickets for as little as $40. It'll be cheaper than a grounds pass for the first week. Spend the day out there—it's perfectly conceivable that your day pass will get you 12 hours of tennis, as it did for some people a couple of years ago. It's sunset and I like sunsets. Where should I go? This is seriously one of the best parts of the U.S. Open! September sunsets. You have two options. The corridor of the upper deck of Ashe provides pretty amazing sightlines to watch the sun drop with the Manhattan skyline as a backdrop. Or! You can do some drinking down at the Red Star Cafe, and just hang in that picnic area near the practice courts. By time the sun drops, everyone has moved into Ashe and you can freely watch the sky turn some amazing late-summer colors. Are there any gimmicky things that the Open does well? Many people on the grounds will be hawking useless things (always ignore the Heineken people). You should, however, get one of the free American Express radios, which hang on a lanyard and play the TV audio into an earpiece. I do not own an American Express card (you need one to get the radio). But there are so many well-heeled people walking around the grounds that if you grab them, they'll usually be very nice about it if you ask them to get you one. This gives you a chance to hear what's happening elsewhere, or, if you're at the court that's being broadcast, it's a good way to break the monotony of watching commentary-free tennis for hours and hours. Should I stand in the South Plaza behind the ESPN cameras to catch a glimpse of my favorite ESPN personalities and the occasional tennis player? I have a ticket in a luxury box. What do I do? If you like tennis, you will hate your luxury box. I went to one last year, finally. It was a box full of publicists and nightlife reporters. They did not watch tennis. If you get there early enough, grab one of the few seats they have outside. Do not stay inside. I want to plan ahead. How much rain does it take to delay a match? Very, very little. Like, rain that is barely hitting your shirt, no-umbrella stuff. That's because those courts get really slick with the smallest amount of rain. But this also helps explain why we've had four straight Monday finals. It takes virtually nothing to cancel a day's worth of tennis. Stuff so light it doesn't even always show up on radar, to the USTA's chagrin. The forecast for the next ten days looks good, but even a teeny bit will delay matches. I'd like to see the practice courts. Where do I stand? This is everyone's favorite ritual! If you have a grounds pass, sometimes you feel cheated ("It's my only day out at the Open and I'm not even going to see Roger Federer"). Well, the practice courts are always, always mobbed. Kids at the fence holding those oversize tennis balls. This isn't fun. The best way to handle this is to go over to Court 4. Run up to the top row of the bleachers there and you'll have great unobstructed views of the practice courts. Usually, some people figure out this secret, but most won't bother with the trip. Oh, and apparently the Red Star Cafe has been demolished and replaced with a new Red Star Cafe with an upper deck? I have not been, but I know the angle and there's almost no doubt that this will have a great view of the practice courts as well. When do celebrities show up? Celebrities kind of honor our workweek schedules. For whatever reason—this is totally anecdotal but trust me on this—they don't show up until the second week (this does not include Tony Bennett and David Dinkins, who seem to be there every day and every night). How much am I allowed to complain about how horrible my seat is at Ashe? Plenty! Ashe provides some of the worst views of tennis. We should never stop complaining about this since sitting in the upper deck of Ashe, as Slate once put it, is like watching tennis through the "wrong end of a telescope." It is wrong. But there's something else to say too: As horrible as Ashe is—so much great space in the lower decks reserved for so few seats, so they could cram in as many luxury boxes as possible—the building makes a very nice center for a marvelous tennis campus. When you're roaming the grounds around twilight, appreciate the whole look of the place. Ashe does its best work when you're standing outside of it. More questions? Kinja, down below!